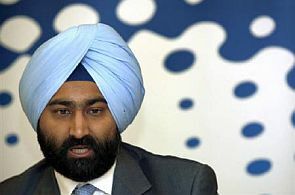 Rediff.com » Business » Were Ranbaxy's directors aware of the malpractices? Were Ranbaxy's directors aware of the malpractices? The board of directors is said to be the brain of a company; independent directors are said to be its conscience keepers. Business Standard assesses how the board, especially independent directors, of beleaguered drug major Ranbaxy Laboratories functioned during the period when its manufacturing practices came under a cloud in 2004. True to its stature as India's flag bearer in the international pharmaceutical scene, the company had eminent people from all walks of life on its board. During the period, the Ranbaxy board had eight independent directors, including then chairman Tejendra Khanna, now Delhi's lieutenant governor. The other independent directors were DCM family scion Vivek Bharat Ram, Gurcharan Das, senior cardiologist P S Joshi, ace investment banker Nimesh N Kampani, consultant Vivek Mehra, senior lawyer Surendra Daulet-Singh and foreign trade expert J W Balani. For Ranbaxy, 2004 was significant in more ways than one: It was the year when Davinder Singh Brar, chief executive officer and managing director, decided to hang up his boots, after completing his five-year tenure on July 4. Brar was succeeded by Brian W Tempest. The year also saw promoter and key shareholder Malvinder Mohan Singh, who had earlier held the post of director (global licensing) and who had led India operations as regional director, succeeding Tempest as president (pharmaceuticals). Weeks before Brar left, another significant change took place: In June 2004, Rashmi Barbhaiya, president (research and development, or R&D) since April 15, 2002, left the company to pursue other professional options. This put Rajinder Kumar at the helm of R&D. In the few months he was there, Kumar triggered a $550-million time bomb that would go off about nine years later. Whistleblower Dinesh Thakur, Kumar's subordinate at Ranbaxy, would, years later, claim his boss had made a detailed presentation of the alleged widespread manufacturing lapses and fudging of data in the company first to "a closed door board of directors meeting in Thailand" in September 2004 and then to the science committee on December 21, 2004. While Kumar has been silent on the events, Ranbaxy has pleaded guilty to several charges by the US Food and Drugs Administration (FDA), based on Thakur's testimony. While it is difficult to ascertain what happened during and after those two critical meetings, Ranbaxy's annual report for the year records Kumar left due to "unforeseen personal problems". This means Kumar quit within 10 days of the science committee meeting held on December 21. It is difficult to fathom such eminent board members did not find anything amiss. There is confusion over the board's September "closed door meeting", following Malvinder Singh's comment that no board meeting was held in Thailand and the fact that the annual report doesn't have records of a board meeting in September. However, the science committee meeting is duly recorded in the annual report; it was attended by P S Joshi and Tejendra Khanna, independent directors, as well as Malvinder Mohan Singh and Brian Tempest. The annual report adds, "In the resulting situation, Tempest, CEO & MD (chief executive officer and managing director), took it upon himself to closely oversee the R&D activities directly, with separate heads for new drug discovery research on the one hand, and for novel drug delivery systems (NDDS) and generic drugs development on the other, reporting to him." However, Ranbaxy did not announce the departure of its R&D head for months. On March 11, 2005, the company, in a statement, said it had "reluctantly agreed to his request due to personal circumstances. In due course, he will be invited to join Ranbaxy's R&D advisory council". Brian Tempest said, "We acknowledge the role Rajinder Kumar has played in institutionalising the R&D regimen, and in particular, the clinical processes at Ranbaxy." According to a Business Line news report, that day the Ranbaxy stock fell 1.23 per cent on the BSE, closing at Rs 1,069.5. The report quoted an analyst saying, "While the company has been talking about focusing on R&D, the frequent movement of scientists sends contrary signals." So, what happened between December 2004, when the annual report records Kumar's exit, and March 11, 2005? Did personal circumstances lead to Kumar's exit? Or, did his presentation and the response of the board and management cause it? If the board of directors didn't have all the details about Kumar's sudden exit, it should have sought all the details it required to take an informed decision, said a governance expert. On the other hand, if it was privy to the detailed presentation by Kumar, it made a clear attempt to sweep things under the carpet, which amounted to a conspiracy against the stakeholders including the government, consumers and minority shareholders. In the annual report for 2004, the directors' standard disclosure stated, "The directors have taken proper and sufficient care for the maintenance of adequate accounting records, in accordance with the provisions of this Act, for safeguarding the assets of the company and preventing and detecting fraud and other irregularities." One of the directors said they were not aware of a fraud at that time, but declined to come on record, as his current organisation wanted to distance itself from the controversy. Another said even today, he didn't believe there was a fraud at Ranbaxy. "We knew there were ongoing dialogues with FDA. Such dialogues go on all the time. But this does not mean there was fraud. All the charges by FDA can be challenged in courts. Every company deals with these FDA cases differently. Acceptance of guilt is a necessary condition in a plea bargain. The decision to settle through a plea bargain was a business decision by the new owners. The media is making a mountain out of a molehill," the former Ranbaxy independent director said. When asked what would happen to the people who used the medicines prepared through questionable practices, he said, "Nothing happened to them." Business Standard emailed questionnaires to all the independent directors, asking whether they had knowledge about the problems related to drug research, research data and falsification of data and what action did they take on the subject. None of the directors responded to the questionnaires, sent a week in advance. Offices of Gurcharan Das and Surendra Daulet-Singh said they were abroad. A call to Kampani's mobile phone was answered by his secretary, who promised to revert. Attempts to reach the others on their phones didn't succeed. Though they were caught napping while the company's research and regulatory departments violated drug manufacturing norms and falsifying data, they might walk free - India's companies law and its securities market regulations don't provide for any major penal clauses for such offences. In fact, Gurcharan Das, one of the independent directors on the board of Ranbaxy during the period in question, was inducted into the Air India board by the government even as India Inc was overwhelmed by the controversy over the failure of Ranbaxy's independent directors to act according to their mandate and raise an alarm over governance failure in the company. The Companies Act, 1956, doesn't provide for any action against erring independent directors, or any other guidelines. In fact, it doesn't recognise the concept of independent directors. However, there are relevant provisions in the new companies Act, yet to be passed by the Rajya Sabha. In 2009, after the Satyam scandal, the ministry of corporate affairs (MCA) came out with a framework of corporate governance guidelines. This touches on the concept and prescribes guidelines for the appointment, qualifications, etc, of independent directors, but does not include any penal provision for breach of duties. Experts say in Ranbaxy's case, these, too, wouldn't apply, as the events predate the MCA framework by at least five years. Being a listed company, Ranbaxy is bound by Securities and Exchange Board of India (Sebi) requirements, as stated in clause 49 of the listing agreement. However, these requirements came into force on January 1, 2006. According to the clause, the chief executive officer and the chief financial officer shall certify to the board nothing illegal or fraudulent is happening in the company. "There are, to the best of their knowledge and belief, no transactions entered into by the company which are fraudulent, illegal or violative of the company's code of conduct, during the year." Recently, there have been instances of Sebi taking a critical view of independent directors who failed to notice red flags in financial reporting. In an order against independent directors of Pyramid Saimira, Sebi had said, "While the extent of responsibility of an independent director may differ from that of an executive director, an independent director has the duty of care. This duty calls for exercise of independent judgment with reasonable care, diligence and skill, which should be reasonably exercised by a prudent person with the knowledge, skill and experience which may reasonably be expected of a director in his position, and any additional knowledge, skill and experience he has." The order added, "In either case, they facilitated the company to make false and misleading disclosures and thereby created artificial prices and volumes in the securities of PSTL (Pyramid Saimira Theatre Limited) in the market, to the detriment of innocent investors. I, therefore, conclude the charge of disclosure of false and misleading statements, as alleged in the [show cause notice] against the noticees, is established." Emails seeking comment from a Sebi spokesperson, as well as MCA, didn't elicit any response.